umm... would it be more fit to blank comic topic? updated the opening post with that link. feel free to also post it in the blank comic topic if you want. It's amazing how much character a color can give to a drawing. Updated OP with parts of the Zoo arc. I have only just started this and these are my first ones. I think this arc has already been done but I just wanted to know what people think of them, please reply to tell me what you think. It has been done, actually, but doing this stuff for practice is always good. As for your job, you inherently did very well. However, it's easy to tell that you just colored the original image on the same layer. In deeper programs, like photoshop or GIMP (gimp is free), you can make multiple layers, which you can color to make the image cleaner than using the fill bucket on the same layer. That is very good, It's about the same if not better then what I made when I started with this. You forgotten to color some things, like grapes yellow eyes, and peanuts tongue. I'd also like to say that i'm not very fond of the shading, I'd suggest making it in a very minor light tone, and not bright white. as for the shadow shading, don't drop it in the background like that, it makes it look like cutouts . don't worry tough, I am guilty of doing these things myself back in the day, practice makes perfect, keep at it! Thanks for your replies, I will take it all on board. What software do you use for colouring it in, I use Corel PaintShop Pro X3 is that any good? Also I don't understand how layers work, could you please explain? This might be basic information to you but I am only 15! Well, I don't know if this information will help but I use Photoshop 7 / CS2 and up as my preference, any software can work just as fine as long as you know how to use it tough. first thing you need to find out is how to use layers, once you understand how layers and multiply works, it's pretty easy. here is a tutorial i posted before on how to shade, and it also tells you how to add a color layer. Also, a nice tip is to hold Alt and click a drawing, will select that color. If you notice'd, i have two colors for some, the smaller dot means I use that color, and set the layer on overall. I normally do this when the background is NOT white, but a shade of gray. download link to one of my Photoshop documents. Thanks for the help. It has helped me out a lot. I will continue to do this in the future. Thanks. The shading tutorial I posted is also how I found it best to color it. the only difference is that you stay in the lines and use a color. As for a "fill bucket" option, when you use that, select the layer with the drawings on it, and take a magic wand to selected the outline. then switch to the layer you are currently using to color, and past it on there. I never thought about that! Once again thanks for the help. I might be able to increase the quality of the newly colored comics using GIMP! There are still some B/W strips left from translation thread. Is there anyone who could volunteer to color up those remaining ones? You know that there's me, Valerio. Here are the last ones of "The Zoo" story arc. All the remaining ones are coming. Ah, that's great Cesco! Thank you very much! GREAT cesco. Not many left now! Thanks, Cesco! I thought this project had died incomplete Well done coloring those panels! Last edited by renato on Tue Oct 04, 2016 3:01 pm, edited 1 time in total. Last edited by renato on Tue Oct 04, 2016 3:05 pm, edited 1 time in total. That's all. Great work there, Renato. Here are the next two, plus the last one of the story arc "The Zoo" with Earl's jeans re-colored. The remaining ones from the arc "The Grove" are coming. Coming soon, an evergreen Housepets' Thanksgiving classic, "Delicious, Delicious Food"
Last edited by renato on Tue Oct 04, 2016 2:59 pm, edited 1 time in total. Here we are with "Delicious, Delicious Food". Cesco, you did an amazing work, I cant wait to see the last strips from the Grove's arc. Last edited by renato on Wed Sep 17, 2014 3:45 pm, edited 1 time in total. So on the left is actually a casserole in a bowl rather than a baguette, probably green bean casserole (possibly without the french onions around the edge). The salad looks good to me. 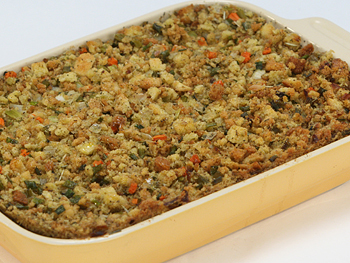 The stuffing in the middle is a bread dish like this. The fresh bread looks nice and fresh. Then the turkey I always imagined more bronze, and the stuff coming out is more stuffing (as in the picture). Thanks Obbl, it's a pleasure to work on these beautiful strips. It's quite difficult to reply a polichrome pattern with a single color. I'm open to suggestions, feel free to submit a better color palette for the food. Thanks for your precious help, Obbl, and thanks a lot to Rick for his wonderful work. 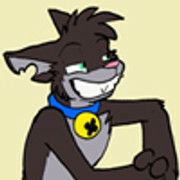 and the strip "2009-04-08-housepets-gets-political.png"(B&W published when Rick was already coloring his strips). So, yeah, there are seven B&W strips, but just three to be colored. Last edited by renato on Wed Sep 17, 2014 3:46 pm, edited 1 time in total. Good to have colored the last one of "The Grove" arc story (it wasn't hard). I'm recoloring the other remaining two (which are harder), but I'm not having much time to do that at the moment, so I'm doing it slowly. The lighted up parts of Grape should have their original color. pure white in the B&W original, and they were not, they were gray, so I based on this difference the global lighting for panels 2, 3 and 4. Very happy you are working on the last two, can't wait to see them. At the end, Renato is doing the last two remaining strips. He's doing a better work and with more time availability, unlike me. Let's wait for his posting of them. These look good. Try removing the highlighting. Rick doesn't use that much. I like shorts. Shorts are comfy. Do you like shorts? I have only just started this and these are my first ones.(... )please reply to tell me what you think. Last edited by renato on Tue Sep 09, 2014 4:29 am, edited 1 time in total. ... and then there were none! So, dear Kiderra, this would be a perfect moment to update the link's list at the start of this post. I suggest a visit to the Italian Translation R.2 thread. Last edited by renato on Wed Sep 17, 2014 3:47 pm, edited 1 time in total. Oh, Renato! Last panel! Peanut's scarf!